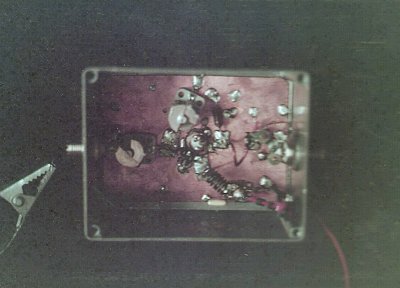 The broadcast equipment consisted of a 10 watt driver amplifier and a 60 watt power amplifier connected to a "Slim Jim" aerial via 10 mteres of low loss coax. 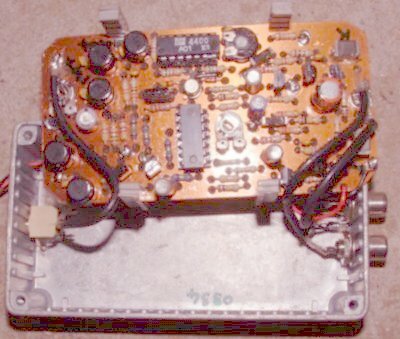 A stereo philips tape deck output was fed into the driver amplifier (The old DDP Radio transmitter) via a Stereo Encoder which gave excellent seperation. Two car batteries provided enough power sufficient for a 4 hour broadcast. 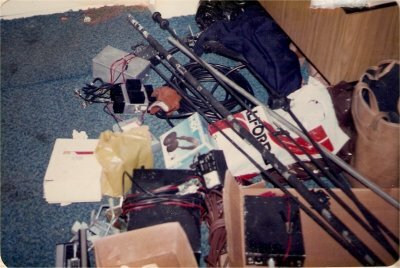 A battery powered mixer was also used on site to fade in a jingle at tape changeover time to give the illusion of a live broadcast (sorry fans -Ed). 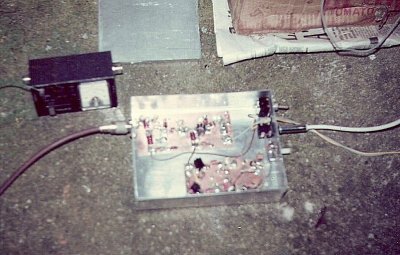 Work was done on a link transmitter in the FM band and another in the TV UHF band but for various reasons they didn't work well. 90Mhz was chosen as the broadcast frequency, as at that time it was clear of all BBC and IBA stations in the south-east. The quality of the transmitter output was measured on an Hewlett-Packard Spectrum Analyser to 2GHz. The Slim Jim is a vertically polarized omnidirectional end-fed antenna having considerable "gain" and this is concentrated almost parallel to ground toward the horizon rather than skyward making it more efficient than a ground plane type antenna by about 50 percent better. It uses a 'J' type matching stub (J Integrated Matching = JIM), hense the name SLIM JIM. Since the vertical angle of radiation is so narrow, about 8 degrees toward the horizon, it usually out performs 5/8 wave or groundplane type construction due to their much higher angle of radiation. It is estimated that the Slim Jim appears to have about 6dB gain over a 5/8 wave antenna due to the extreme low angle of radiation. (Most of the radiation is directed toward the horizion making the "gain" appear much greater than other vertical type antennas). The set-up gave an ERP of 120watts and on a clear day reports were received from Essex, Reading and the south coast. QSL cards were sent in the early days for a confirmed contact.